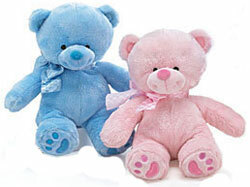 Choose either Myra (pink) or Bryson (blue) Bear to add to your arrangement for a great baby gift. Each bear has embroidered eyes and a coordinating color bow around their neck. 8"H.